You never know what twists and turns might happen in the studio. What started out as two separate pieces, each destined for starring roles in their own story, turned into something completely different. First, there was a bird, which I stumbled upon (literally, I tripped right over him) in a thrift store and paid too much for, probably because the thrift store was an antique store – and you know how the word antique increases the price of an object by about 200%. This bird is definitely not an antique. But I couldn’t resist, he was taking to me, chattering away about all the grand dreams he had. Until I got him home, then not a peep. For months. 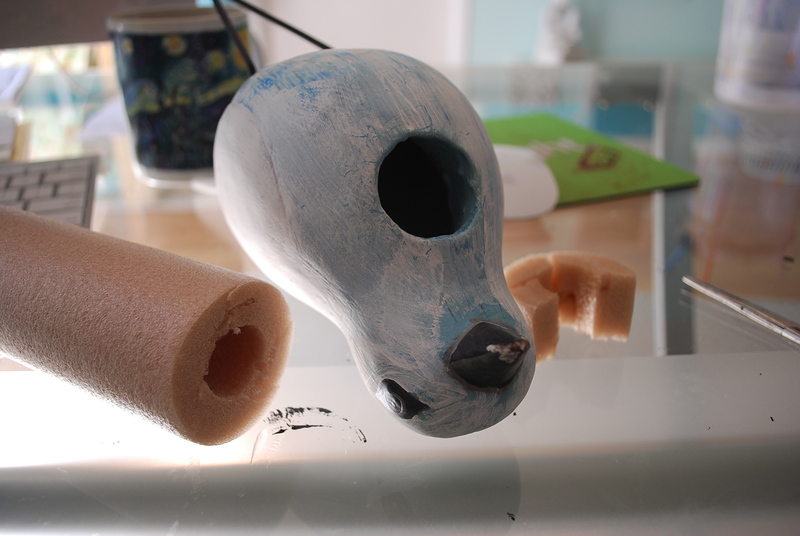 One day, I decided to make him talk, so I painted him, hoping to coax some ideas from him. I would’ve been happy with anything he had to say. I was just tired of him sitting there, mocking me, blank eyed and mute. And he stayed in this whitewashed comatose state for many more months. I decided I would tackle another project until that damn bird decided to start talking again. This would be easy, I had a few ideas of what to do with this piece. Some kind of diorama for sure. I began collecting and forming parts to create an underwater scene but ended up going down another path chasing butterflies through a secret garden. ACkkkkk. This clock was not the right shape for that. But the butterflies carried me back to another time; the days when primordial sludge oozed over the earths surface and that one tiny little single-celled organism supposedly brought forth all the diverse, amazing and complex life we see on our planet today. I would create a time line of life on earth. Then something happened and I lost interest in the idea. 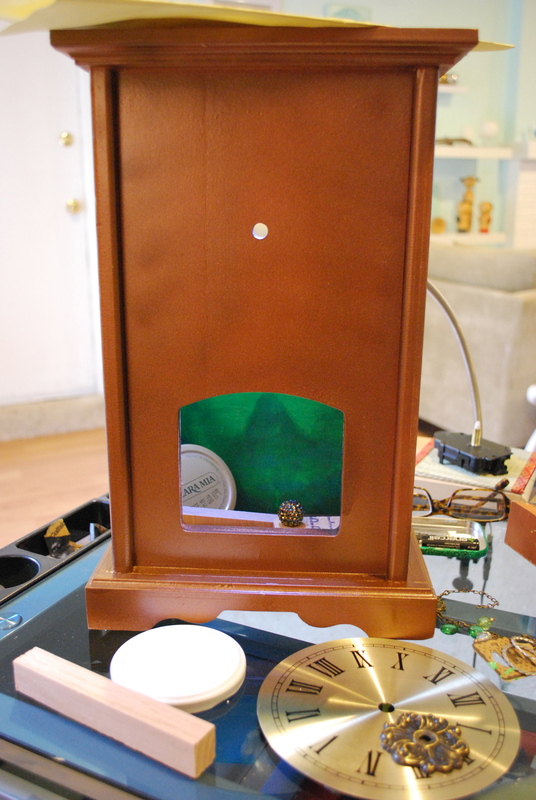 To the unfinished project pile went the clock along with that mute, mocking bird. When I hit an artistic block, I start reorganizing my work space. This could be to make room for the flow of creative energy or just simply a diversion tactic, I’m not entirely sure. As it happened on this particular day, in a moment of reorganization when I haphazardly placed the bird atop the clock, a new idea sprang forth. First, a bit of surgery would be required. I needed to repair the gaping hole in my not so feathered friend’s chest. Dry wall compound worked well for this. And while the opening in his chest was too large, the opening in the clock was too small, so that needed to be fixed as well. 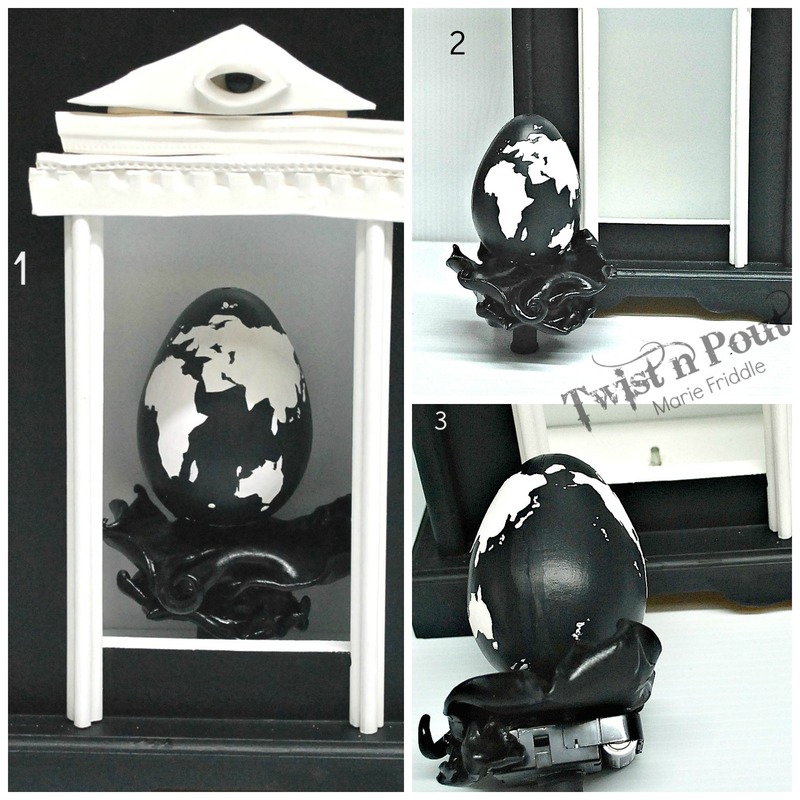 I wanted to include a globe in this piece and I was glad to find a papier-mache egg in my stash. 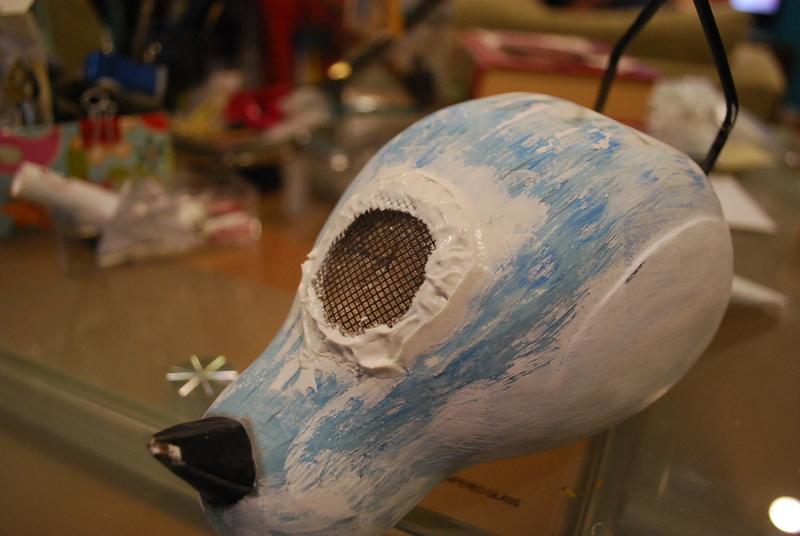 I was not so glad though, when I made a few mistakes in painting it and had to find a way to wash the paint off the papier mache. You know what happens to paper when it gets overly wet… as I tried to gently erase my mistakes the paper began to disintegrate. But I was pretty happy to find a black smooth surface underneath. I free hand cut a tiny map of the world – my deepest apologies for those island countries that may have been relocated or completely omitted – I think Italy is missing its boot heel. But, it doesn’t matter it is the end of the world after all. 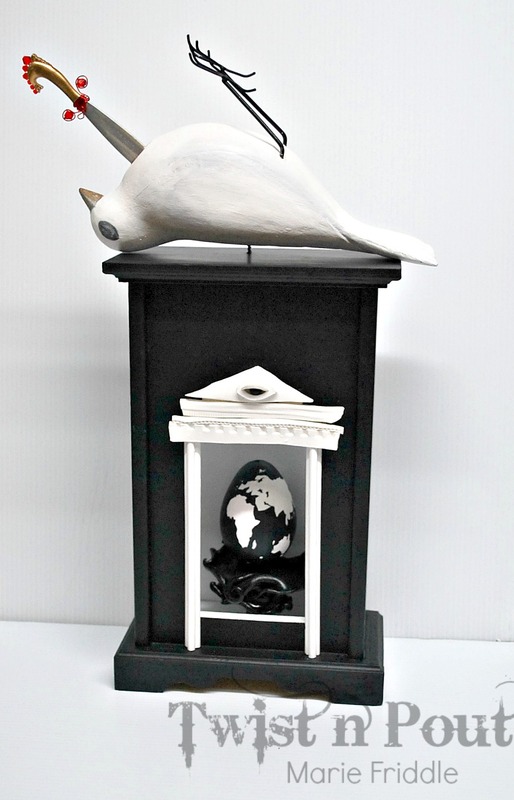 The egg sits atop a rumbling wave of black sludge; a polymer clay tsunami. It was important that the egg rotate, notice it is not on its axis, I struggled with tilting or keeping straight. I thought an earth in complete turmoil would most likely be off its axis, so this works, which was nice because the egg already had centered holes in it. To make the earth rotate, I used a battery operated clock mechanism. This presented two problems; one, the mechanism sat too low and two, the battery would have to be changed which meant the egg would have to be removable. A small wooden spool made a good support and added the right height for the mechanism. I drilled a small hole in the clock bottom to place a peg which the spool would fit onto (2), giving the egg a little support and also allowing for the unit to be removed so the battery could be replaced (3). That is about it for this month. I suppose I could go on and on about all the symbology of this piece here, but I think it speaks on its own. Or maybe not. But I do think maybe that bird learned a valuable lesson.